Classic yet modern, 3 piece microfiber quilt set will brighten up any space.Adds the perfect Vision without feeling the dull of the room.Let love,fun,creative,fashion,hot,animation,implant design of household products show different home ideas. 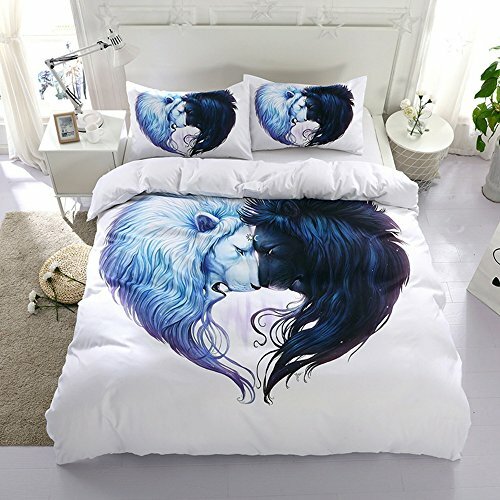 Bedding is people's life with the longest and most intimate items. -Easy Care,Machine washable warm, tumble dry low, warm iron if needed. Designed to last. DURABLE AND SOFT - 100% Polyester Perfect for lightweight for all-season use. Highest quality microfiber and workmanship for long lasting comfort. TOP QUALITY 3-PIECE QUILT SET:1 Queen Coverlet: 90" x 90" and 2 Pillow Shams 20" x 36". Will easily cover all sides and the end of your bed! 1 King Coverlet: 104" x90" and 2 Pillow Shams 20" x 36". Will easily cover all sides and the end of your bed! FEEL THE DIFFERENCE: This quilt can stand alone put on your bed and act as a perfect 3D pictures.Enjoy in the bedroom, RV, and vacation home. Great gift for men and women. 100% SATISFACTION GUARANTEED:Customer satisfaction is of utmost importance to us. We're confident you'll love our products, but if you're not 100% SATISFIED, our customer service team will work with you to make it right! If you have any questions about this product by QIYIGE, contact us by completing and submitting the form below. If you are looking for a specif part number, please include it with your message.